Pierre Wissmer’s music bears testimony to his ethnic origins, his musical education and his time Taking on all these influences, he made them his own, often in a synthetic way. Yet, above all, he used his personal imagination to trace his own creative path, treading it deliberately, making no concessions whatsoever. Pierre Wissmer was born in 1915 in Geneva, of ancien Vaudois descent on his father’s side but his mother Xenia Kowarsky, was of Russian origin. Both parents were doctors. They recognized their son’s talents and helped channel his interests. His mother, whose Slavic charm was irresistible, was fluent in several languages, loved music and would often sing melodies by Tchaïkovsky. She also enjoyed ballet, drama and literature and soon realized which way her son’s education should go. But war was raging at the time and doctors were always on the breach. The family left town and settled in a charming little place named Corsier, a dozen kilometers or so from Geneva. The beautiful light and the serene swaying of the boats on the lake added to the beauty of the place. It was a time of forced reclusion, sometimes brightened up by entertainment, like a performance of Petrouchka. by the « Russian Ballet » which made a deep impression on the young child. This first real encounter with music also added to his awareness of that Russian sensitivity he knew through his mother. Two friends of his parents exercised further decisive influence on his artistic tastes. One, Stéphanie Guerzoni, , was a very famous painter and the other, Andrée Hess, was a pianist and a very good teacher. A keen sportswoman besides, she also developed the boy’s swimming and bikeriding skills. He immersed himself briefly but intensely in painting - submitting to the discipline of learning the technique proved too difficult. Music, on the other hand, made its way slowly but surely. Pierre Wissmer started studying music at the Genève Conservatoire while still at high school. He gratuated as a classics major and, following his parents’ advice, decided to study law, but at the same time got quite involved in his piano studies. Robert Casadesus, then a frequent visitor at the Genova Conservatoire, encouraged him warmly. Unfortunately, the young man felt very disappointed by what the harmony class had to offer: neither Ravel nor Honegger nor Stravinsky were used as examples; and his aesthetic aspirations could not be satisfied with Beethoven and César Franck alone. The vitality of the musical scene in French-speaking Switzerland at that time is reflected in the names of composers Jacques Dalcroze, Ernest Bloch and Frank Martin. France and Switzerland enjoyed excellent artistic relations - of which Ernest Ansermet is the emblematic figure. Promising young musicians were keenly encouraged to go to the Paris Conservatoire. And so Pierre Wissmer prepared for the entrance exam. Both Jules Gentil and pianist Jacqueline Blancard helped him improve his techinque and get ready for the famous school. He made the first round at the top of the list, but relaxed a bit too much, spending more time with his lady friends than with his piano and flunked the finals. Was it a wink of Fate? Other roads beckoned to him. He is recommended to Roger-Ducasse, who has just taken over the composition class from Paul Dukas, and accepts Wissmer as an auditor. Wissmer is fascinated by this teacher whose culture and professional strictness force him to work on his own technical background, especially composition. He also registers at the Schola Cantorum where Daniel-Lesur, a member of the board of governors, teaches counterpoint. The student and his teacher (who is but seven years his senior) strike a deep friendship which will last all their lives. In the open-minded atmosphere of the Schola, Daniel-Lesur proved most instrumental in helping Pierre Wissmer understand his own creative nature, mastering the rules of counterpoint as well as the thought process inferred by this particular technique. Indeed, all his music will make use of learned or graceful contrapuntal textures. Every comment on form, instrumentation, balance - always exposed, never imposed by his teacher - is beneficial. Studying with Daniel-Lesur is a liberating experience, as he wrote later : « Composition was no longer a exercise void of sense. It became the composer’s tool, sharpened to perfection. Of course, rules were strict yet always justified from the viewpoint of clarity of expression, more elegant, more appropriate to one’s idea, and in the end more personal. ». Pierre Wissmer also studied conducting with Charles Münch at the Ecole Normale de Musique, thus rounding off a solid music education. Endowed with powerful intuition and generous imagination, Pierre Wissmer first wrote chamber music before moving on to orchestral music, which he’ll write all his life with the strong hand of a refined color-expert. His first piano concerto is premiered by Jacqueline Blancard and broadcast live on February 10, 1937 with Henri Tomasi. conducting. A year later, his first symphony is premiered in Winterthur by Hermann Scherchen. In 1939, he composed Le beau dimanche, a one-act ballet on an argument by his friend Pierre Guérin, who introduced him by and by to people like Stravinsky, Poulenc, Sauguet, Cocteau, Bernac, Bérard and Hervé Dugardin to whom he’ll always feel very close. Joining the French army during the war, as a « Swiss citizen living abroad » (he became a naturalized Franchman in 1958), he was drafted into a motorized artillery unit sent from place to place at short notice. He went to Talloires a few times to meet with Daniel-Lesur. Then he had to go back to Genova where several of his new pieces were being premiered, among which his first concerto for violin with the Suisse Romande Orchestra. In 1944, he was appointed professor for composition at the Genova Conservatory, and head of the Chamber Music Dept. at Radio-Genève. In spite of his many obligations, he’ll never neglect what he considers a superior calling : composition. A rational realist, he’s inclined to act, yet his strong inventiveness urges him to create. During the following years, he tackled varoius genres. He composed Marion ou La belle au tricorne, an opéra-comique. He also wrote many chamber music works for piano, voice and string quartet, music for the radio, including L’histoire d’un concerto which was awarded the Grand Prix suisse de la radio and his Second Symphony. On February 6, 1948, he married Laure-Anne Etienne, a former pupil of Marguerite Long at the Paris Conservatoire. After the young couple settled in Paris, she helped and assisted him all throughout his career. From 1952 to 1957, Pierre Wissmer was assistant-director at Radio-Luxembourg, later director of programming at Télé-Luxembourg. At the beginning of 1957, Daniel Lesur, now head of the Schola Cantorum, called him to be his assistant (he’ll be director of the Schola in 1962-1963), and put him in charge students, most of them of excellent and varied cultural backgrounds, he shone forth as a teacher. Confiding in his pupil Jean-Jacques Werner, he once said : « To be in total agreement with oneself is fundamental... » but added « no matter what your musical idea is worth, it will never go anywhere nor live without proper setting. ». Setting is his prime concern. Setting and not musical language : « The issue of « language » is a non-issue which has bothered only minor musicians or major musicians at particularly low times of their creative lives... ». Asked about the careful working-out of a piece, he insisted on the demands and priorities of the job : « The right form, the choice of proper sound materials, the balance between the various elements, the beat of the musical discourse, the fine-tuning of polyphony (i.e. pattern) and of orchestration (i.e. colours), the definition of all details of performance (breathing, bow-strokes, nuances, tempi) all this needs the clocklmaker’s percision and the Benedictine’s patience, both led by the water diviner’s intuition. ». A very dedicated teacher, Pierre Wissmer was nonetheless very aware of his creative mission. Over the years , he composed some powerful works, refelcting the evolution of his way of thinking, always noble and full of natural distinction whether going through ardour, austerity or asceticism. Symphonic and operatic music seem to be his two favourite genres. If some works are commissioned (among which his opera Leonidas, for the Jeunesses Musicales Françaises), his personal inclination also leans this way. A symphony cycle grows with regularity - a third symphony for string orchestra, the following ones for full orchestra - and manages to express his ideas in a niw manner each time. His vast instrumental knowledge prompts him to write concertos for solo instruments : clarinet (1960), trumpet (1961), oboe (1963), and flute (Concertino-croisière in 1966). That same year, he wrote the State-commissioned concerto valcrosiano, whose name is derived from the little hamlet in Provence where he used to spend his summer vacation. In 1965 his oratorio Le quatrième mage was awarded the Grand Prix Paul Gilson by the French-speaking Countries Radio Association. He himself conducted the premiere at Radio Suisse Romande. In 1967, he composed a ballet : Christina et les chimères (argument and choreography : Michel Descombey) and was awarded the Grand Prix de la Ville de Paris for Quadrige, a quartet for flute, violin, cello and piano. At that time, he is very much attracted by chamber music. Quadrige, was followed by Sonatine pour flùte et guitare and Quintette à vent in which he tried, according to his own words, to achieve « harmonious balance between the virtuosity inherent to the genre and the formal and sound structures of pure music. He is indeed the epitome of balance himself, combining - as Bernard Gavoty and Daniel-Lesur once wrote in a portrait of the composer « typical French clarity and Swiss precision, together with a very Italian taste for brilliance and just that touch of Slavic nonchalance, inherited from his mother ». During the sixties and seventies, he travelled extensively as a guest-conductor and teacher. During the Montréal Expo’ ha was in charge of an orchestration and analysis course at the Music Pavilion. In 1969, he was appointed director of Le Mans National Music School and in 1973 professor for composition and orchestration at the Genova Conservatoire. Ten years later, the city of Genova awarded him its Grand Prix Musical for his lifetime achievement and his decication to Swiss musical life. 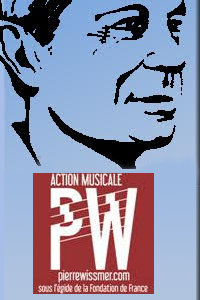 Pierre Wissmer died in France in 1992, shortly after his wife whose ongoing support helped him all his life. She most aptly commented on her husband’s work : « Is Pierre Wissmer’s music classical, romantic or modern? Any aspect should not exclude the other two. His music is in no way backward-looking, yet it would be jumping rashly to conclusions to try and confine it to any of the musical « schools » of our century. People usually acknowledge his writing technique to be filled with wirtuosity, as regards polyphony or orchestration. Maybe it would even be more relevant to note the subtle adequacy between his language and his very individual thought, robust yet delicate, in which the sheer exhilaration of life stumbles over anxious questioning ». Audiences have always welcomed his music, wether ballet, opera, great symphonic works or concertos. Indeed, in its tragic or serene message, every listener can hear the soul of a man whose powerful thought could only find its right expression through the medium music.